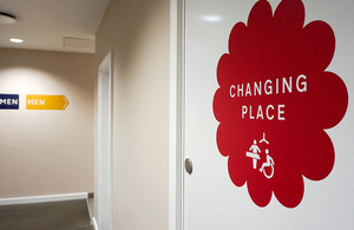 The Department for Transport is (DfT) partnering with Muscular Dystrophy UK (MDUK) to award the money for Changing Places toilets, which officials said are expected to be ready by the early 2020s. By providing more space and specialised equipment, including adult-sized changing benches and hoists, Changing Places facilities allow people with conditions like muscular dystrophy and cerebral palsy to use toilets safely and comfortably. Officals said a lack of suitable facilities affects more than a quarter of a million people - who cannot use standard disabled toilets - across the UK. Transport accessibility minister Nusrat Ghani said: ‘This marks the next step towards our ambition of delivering a fully inclusive transport network. Catherine Woodhead, chief executive of MDUK, said: ‘Individuals and families living with a disability often tell us that travelling by car is the easiest way for them to get from A to B.
MDUK will work with the DfT to allocate funding based on detailed proposals by the operators of motorway services. The DfT’s partnership with MDUK was announced last November under the Government’s Inclusive Transport Strategy.